This month Lesvos has been picked as one of the 22 European Destinations of Excellence for 2009. Other regions on the list include: the Viroin Hermeton Nature Park in Belgium, Vouni Panagias on Cyprus, the Northern Vosges Regional Natural Park in France, Park Gravenrode in the Netherlands, The Bird Republic in Warta Mouth in Poland and the Municipality of Remich in Schengen, Luxemburg. This nomination is a small consolation for the tourists who are here now and who have to endure heavy rainfalls and thunderstorms. I can imagine they are a little disappointed, because going on walks will be a challenge - because they would have to cross many a mud stream trying to find its way to the sea. So I pity them, but as I am living here I secretly love all this water. The summer dust finally gets washed away and lovely fragrances are freed. It is a real joy to inhale he fresh odour of the pine trees, the spicy smell of the earth and the prickly smell of the first wood fires. In between the rain showers I am quite enjoying trying to navigate the mud, over the pine needles brought down and rendered by the rain into artful patterns, and between the olives that have started to fall; and I am careful not to step on the snails that now are part of the micro traffic on the paths. And when you see some Greeks with their noses down shuffling through the landscape, you know that they are not looking for chorta (wild vegetables) but for snails (saligaria). I love to eat snails, but not to prepare them. I know it is a little contradictory maybe to enjoy eating them but to be too afraid to kill them in order to prepare them for cooking, but I cannot butcher a chicken, cow or pig, either, even though I eat their meat. Another way to clean them is to put them in water with some vinegar, and an even more lousy way is to starve them: they are put in a box/cage for 5 –6 days without food so they will empty themselves. I am sure that I would not sleep one night, or would free them on the their first day of fasting. But snails are very healthy to eat. They have lots of calcium, they are rich in proteins and they have lots of vitamins B1 and E. It is said that snail eating is good for curing anaemia, asthma and rheumatics. According to an article on the internet, a Dutchman Ruud Bank in 1988, found as many as 63 species of land- and sweet water snails on Lesvos. I could not find much more about his investigation or this Mr Bank so I have to do it with the list of the 63 snail names. I guess the species of snail that I always encounter on my way around here is the Helix cincta anatolica, a snail which probably came from Anatolia in Turkey. The Greeks that lived in Anatolia used to prepare snails with onions, tomato sauce and bay leaf. On Lesvos, where many Anatolian Greeks fled at the beginning of the 20th century, they also add quinces, which makes a delicate combination of tastes. People from Crete however have the most snail recipes. It is said that they know as many as 300 ways to cook them. A Cretan cook once served snails at a festival in Athens cooked in 20 different ways. ‘Bourbouristi’ is the name of a Cretan dish with fried snails. It is named after the plopping sound the snails make when they fall into the hot oil. Then they are seasoned with olive oil, vinegar and rosemary. Another snail dish is made with bulghur, tomatoes and spices; another with potatoes and spices and, continuing like that you can vary the ingredients until you have 300 recipes. 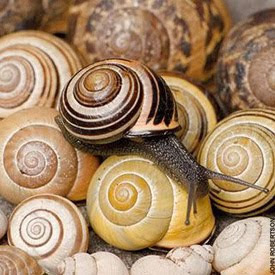 Especially in Bulgaria snail farms prosper. This year this Balkan country will export no less than 800 to 900 tons of snails. Mostly to France, but also to Germany, Austria and the Netherlands. And even now they cannot meet the demand. Here on Lesvos you only have free-range snails. You can even think of the island as one big snail farm. The Cretans may say that snails are a Cretan speciality, but first try out this Lesvorian recipe: snails with quinces. Fry the onions in some oil. Add the tomato sauce, the snails and the bay leaves. Stew it a little, than add salt, pepper and cinnamon. Then add the quinces and olives. Cook until the quinces are soft, then the dish is ready to serve.